WashCycle beat me to the punch here, but there's a lot of bike stuff that will be discussed at this Wednesday's Alexandria Transportation Commission meeting. First, and likely foremost, will be Complete Streets. During the meeting two months ago, staff had raised concerns about the then-proposed Complete Streets ordinance, and recommended a resolution and checklist instead. After a good bit of debate, the Commission tabled the subject and appointed a sub-committee to further study Complete Streets and the staff-proposed resolution, after which it would be reintroduced at a future meeting. This week's meeting is that "future meeting". - Replaced "should" with "shall", which theoretically gives it at little more sticking-power with regards to how the city implements Complete Streets on a given project. - Directs city staff to create a "Complete Streets Checklist" to be used for all development and city road projects. - Requires the director of the ciy's Transportation and Environmental Services (T&ES) department to state, in writing, why Complete Streets would not be used on a given project. - Directs city staff to prepare an annual "Complete Streets report" for the Transportation Commission, including where Complete Streets was not incorporated into a given project and why. Also, Barbara McCann, executive director of the National Complete Streets Coalition has been invited to speak at a Transportation Commission workshop on Complete Streets that will preceed Wednesday's meeting. First reported by the Post's Dr. Gridlock last week, but also mentioned yesterday by the Examiner, Alexandria is considering placing roughly 6 (and perhaps up to 10) bikeshare (likely Capital Bikeshare) stations total in the Old Town, King St Metro/Carlyle (between King St and Eisenhower Ave), and Del Ray areas (Del Ray was not mentioned in the news articles, but is in the city's Transportation Commission documentation). The stations would be funded from the city's annual allocation of Federal CMAQ and RSTP funding for Fiscal Year 2013. Which means, if this goes through, it would still be at least the summer of 2012 before we see them. Until then, the closest CaBi station is on Arlington's side of Potomac Yard. Another CMAQ/RSTP request regards bicycle parking at Metro stations. The city is requesting $250K in FY2016 for additional bicycle parking at the city's Metro stations...likely focusing on King Street and Braddock Rd. A third CMAQ/RSTP request is to rebuild the city's "Alternative Mount Vernon Trail" where it parallels the railroad spur between Abingdon Drive (the GW Pkwy frontage road) and Royal Street. Speaking from experience, the existing trail is very rutted and narrow, and this reconstruction aims to improve both of those situations. The city's requesting $500K in FY2013 dollars to do this. Lastly, there's an item for consideration of a city Long Range Transportation Demand Management (TDM) Plan, which may have a future impact on bicycling and walking in the city as both modes are conducive to the goals of TDM...increasing transportation efficiency and reducing congestion. So I didn't get voted in as chairman (sorry, Allen). But all in all I think it was a good start to the BPAC. Lots of issues to tackle in the upcoming months. Will post meeting minutes once our secretary writes them up. The "inaugural" Alexandria Bicycle Pedestrian Advisory Committee (BPAC) meeting is tonight at VeloCity (on Union St) at 7pm. This is where we finalize our reorganization (from the old BikeWalk Alexandria), elect officers, and continue the business of advocating better bicycle and pedestrian transportation in Alexandria. If you read this blog post in time and can spare a little time, feel free to come on down. DC Councilmember Phil Mendelson got an earful from residents Friday at a hearing he held on bicycle and pedestrian safety enforcement. The basic gist from the stories, reports, and tweets is that there's a chronic problem both with a general lack of traffic enforcement. There's also a lot of errors, inconsistencies, and falsehoods regarding MPD officers knowledge of bicycle and pedestrian laws. Greater Greater Washington, including David Alpert's testimony at the hearing. TBD On Foot live blogging. Lastly, several tweets were made using the #pedbike hashtag. 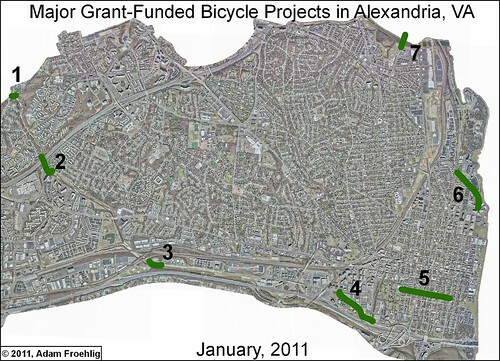 Tonight's Alexandria Transportation Commission meeting was a short, quiet one, largely focusing on updates on several bike/ped projects in the city. All 17 of the projects briefed are being funded via grants of some sort, whether CMAQ, Safe Routes to School, or some other sort of transportation grant. 14 of the 17 projects are fully funded. The remaining 3 (of which 2 are effectively the same project) are big-ticket, high dollar projects that don't currently have a funding source, although the city's consideration of the Commerical Add-On Tax (mentioned before on my blog) is one possible funding source. Grant funding totals just under $7.8 million, with about $8.3 million remaining unfunded for the three projects in question. 5 of the projects fall under Safe Routes To School, and improve sidewalks and/or pedestrian crossings in the vicinity of the selected schools, or provide bicycle parking at schools across the city. 4 more projects are related to pedestrian safety, with focus areas being on Duke St near Landmark Mall, the Edsall Rd/South Pickett St intersection, and near the King St Metro station. 1 - Holmes Run/Chambliss Crossing. This project will build a low-profile crossing of Holmes Run near the north end of the Holmes Run trail near Chambliss St. The crossing will connect to a similar trail in Fairfax County that continues north towards Columbia Pike. Final design is mostly done for the trail and the city hopes to begin construction this summer or fall. 2 - Holmes Run Trail There are two parts to this project, a study, and then construction. Both are partially funded (about $2 million for the construction part), but both will need additional funding to be completed. The study area emcompasses that part of the trail between North Ripley Street and the north side of I-395. This part of the trail is in poor condition and is effectively a storm outflow during periods of heavy precipitation. The study will identify recommended improvements to be made to this segment, which are expected to involve significant construction. Design is planned to begin next month. 3 - Eisenhower Ave Underpass This project was funded via ARRA (i.e. the stimulus) and is currently under construction. It's building a bike/ped connection underneath Eisenhower Ave at Holmes Run, connecting the Eisenhower Ave multi-use trail with the Holmes Run trail without having to cross Eisenhower Ave at-grade. The project is 85% complete and the city hopes to have it completed in the next few months. 4 - Old Cameron Run Study This "project" is actually a study, and will look at a possible bike/ped trail running along Old Cameron Run between the Eisenhower Ave/Mill Rd intersection and the southwest corner of the city's waterworks near the Beltway/Route 1 interchange. In conjunction with improvements along Payne St and Wilkes St (see below for the latter), construction of this trail will provide a bike/ped connection between the Eisenhower Ave trail and the Mt. Vernon Trail. 5 - Wilkes St Bikeway This project just began early design, and will provide a series of bicycle improvements along Wilkes St, between Payne St and Royal St, where it connects to a bike/ped tunnel which runs to Union St and the Mt. Vernon Trail. Possible improvements include bike lanes, sharrows, better curbs for the sidewalk segments between Route 1 and Columbus St, and also bicycle signals. 6 - Mt. Vernon Trail at East Abingdon This project will reconstruct the segment of the "Alternate" Mt. Vernon Trail that parallels the railroad spur between East Abingdon Drive and Royal St/Bashford Ln. It's possible that it will include the rest of this part of the trail all the way down to 1st Street. The reconstruction project will widen the trail to modern standards where right-of-way allows, but will try for a minimum of 8ft. 7 - Four Mile Run Bicycle/Pedestrian Bridge This project is the other unfunded project, though funding exists for design work. This new bridge over Four Mile Run would be for bicycles and pedestrians, connecting Commonwealth Ave on the Alexandria side to Eads Street on the Arlington County side. These projects will go a long way towards providing the "network connectivity" that is important for any successful bicycle route system. I look forwards to seeing future projects that expand on this connectivity.